With Valentine's Day coming up Thursday, February 14, it's time to start planning something special. Check out the unique possibilities at Rockefeller Center, ranging from exclusive performances to sky-high cocktails to an interactive journey through the cosmos. SPHERES: Even though you'll each be traveling in your own worlds during this 50-minute VR experience of space, the super-close encounters with Saturn, Jupiter and the stars will get your hearts beating, and give you plenty to talk about at the your next destination—maybe a romantic, post-galactic drink. Screenings run till 8pm daily (through March 3), and you can purchase tickets here. Bar SixtyFive: For another stratospheric encounter, gaze out over NYC from the 65th floor as you indulge in outstanding drinks and dishes at this sophisticated spot. For Valentine's Day only, the lounge is serving a three-course prix fixe menu with optional wine pairings. A bonus: when you look out to the top of the Empire State Building, it will be glowing red with "dynamic heartbeat lighting." Reserve here. Radio City Music Hall: "Sweet Love" is among the most famous songs of soulful R&B singer-songwriter Anita Baker. The eight-time Grammy winner plays this world-famous jewel of a venue on February 13 and 14 as part of her Farewell Concert Series, which is sure to draw lots of sweethearts. Purchase tickets online. Rainbow Room: This legendary spot hosts a one-night-only Valentine's Day performance by country star Trisha Yearwood, singing from her genre-crossing album of Sinatra tunes. Tickets include a four-course dinner with wine pairings, and are available here. And if you're feeling amorous all February long, the next-door Bae Bar pop-up is serving cocktails and bites with a Valentine's vibe on February 7, 18 and 22. Both facing the Rink, The Sea Grill is serving a sumptuous prix fixe with optional caviar service, while Rock Center Café is offering both an à la carte menu and a three-course dinner for the occasion, featuring dishes like oysters Rockefeller and duck two ways. In addition, The Sea Grill is hosting a special Taittinger Champagne dinner on February 13. At Morrell Wine Bar & Café, you can choose among dishes on a tasting menu with bubbly pairings, or take your pick from the world-class selection of bottles. And the Valentine's menu at Del Frisco's Grille is a sure to fan the flames for steak lovers. 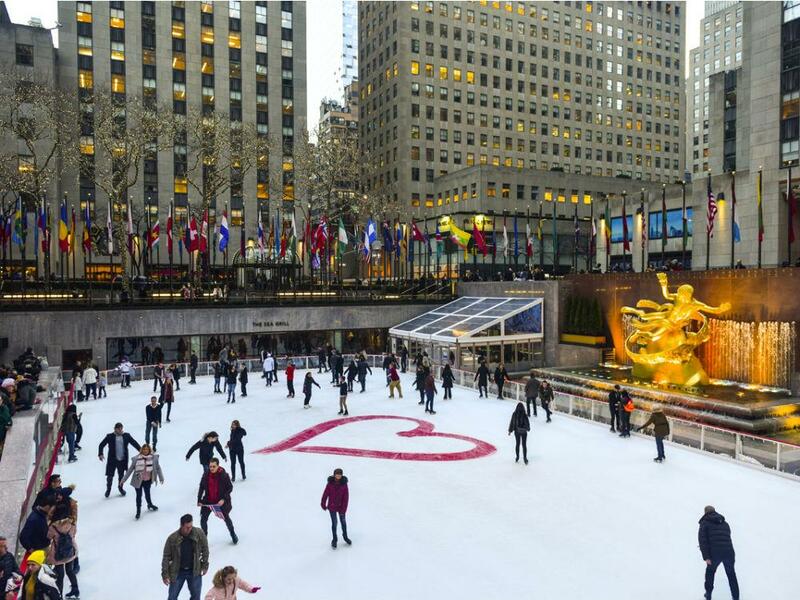 Meanwhile The Rink at Rockefeller Center, which will have a red heart painted on top, is a New York favorite for Valentine's Day (and engagements), with the last skating session of the night starting at 10:30pm. Also, check out out skating and dinner packages that wrap up at Rock Center Café or The Sea Grill. Top of the Rock, beloved for its stellar views from the observation deck, is another NYC classic for romance (plus you can see that red-hot skyscraper lighting on February 14). And for something on the sillier side—if you can get away by the afternoon—the Tour at NBC Studios is always fun for pop-culture lovers, with a chance for you and your date to make a late-night clip.